It may not reveal the Barad-dur, but oddly enough, I didn't want another Dol Guldur; I wanted something fresh, and that's what Gorgoroth delivers. Ostigurth is probably the closest ICE ever came to Erelhei-Cinlu, where if you behave yourself and look right (in this case mannish), you can wander about the city without being hunted down like a dog. And just like Vault of the Drow's aching resplendence -- those purple glows and phosphorescent "moon" are burned in the minds of all old-school D&D players -- Ostigurth's Tower of Blood is "a fortress of both spectacular horror and terrible beauty", its crimson skull-shape overlooking the city with burning eyes. No other place in Middle-Earth, not even Minas Morgul, has the deathly ambience of Ostigurth, yet in a disturbingly civilized way. This is a place for DMs to populate with torture parlors and bordellos, and where mannish captains hold forth at expansive banquets, while just down the road hundreds of corpses roast on public pyres. The city teems with life by thriving on death, and offers, I believe, more creative opportunities than a killer-repeat of Dol Guldur. For more standard fare, there are orc and troll complexes outside the city walls. "When the doors are opened, the man screams in agony, for he feels the pain of being torn in half and dying. Upon closing the doors, he magically comes back to life, only to wait for the next time the doors are opened. His screams will alert anyone nearby to the presence of guests. While whole, he retains the ability to speak, along with his personality and memory." Then there are the Nine Thrones of Gorgoroth, on the third-level audience hall, which at the command of their respective Nazgul cause victims to -- turn into a wraith (the Witch-King's), quiver on the floor in terror of a dragon illusion (Khamul's), be cursed with lycanthropy (Dwar's), turn to stone in sunlight (Indur's), be struck with a lightning bolt (Akhorahil's), be struck with an ice-cone (Hoarmurath's), suffer excruciating pain when talking (Adunaphel's), be struck with a fireball (Ren's), and take on the facial features of a mule (Uvatha's). The City of Blood in many ways prefigures Minas Morgul, and even after the move in 2002, one or two Nazgul always remain based here. Which brings me to Mount Doom. Sauron's forging complex is more than I expected, and unreachable to all but the most resourceful players. Concealed behind the Crack is, first, a chasm with the illusion of a Balrog extending its tongue all the way over from the other side. Beyond this lies Hojatskatur, "the Hall of Hell", a shrine dedicated to Sauron's achievements, and containing astounding artifacts like the actual Sceptre of Numenor. From this room a stair descends for over 600 feet, interrupted by five platforms every 100 feet or so where a riddle must be answered to continue down. These riddles are the hardest part of the dungeon, difficult for even Tolkien scholars; my friend guessed only the fourth (Carcharoth the werewolf), though came close to the second in a weird way (Glaurung, which was his guess for the first riddle, instead of the correct Thuringwethil). Failure to supply correct answers results in obscenely lethal traps that don't bear repeating... though I'd be remiss in not reliving my sadistic glee at a PC's internal organs exploding into fire for botching riddle #3. 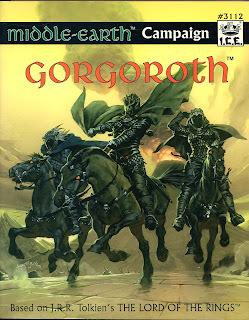 Gorgoroth was a product worth waiting for, and I've only scratched the highlights. Many more sites are mapped out: the Barad-wath tower overlooking Nurn, occupied (from 1640-2000) by the Eighth of the Nine; the Isenmouthe gate complementing the Black, held (from 1652-2000) by the Fourth; Minas Durlith, the only fortress of Mordor to withstand the assault of the Last Alliance. And there are dozens more NPCs besides the Nazgul: the Mouth, old players from Angmar and Dol Guldur, and new ones just as bad. Next up: Havens of Gondor. Ack! How could you not mention the whole section in the back about playing Orc PCs?!? The best part of the module! But yes, a great book, probably one of the best ICE produced. You make a good point, and there's so much I could have raved about this product. But since my campaigns never involved orc PCs, that's probably why it escaped notice in a retrospective.